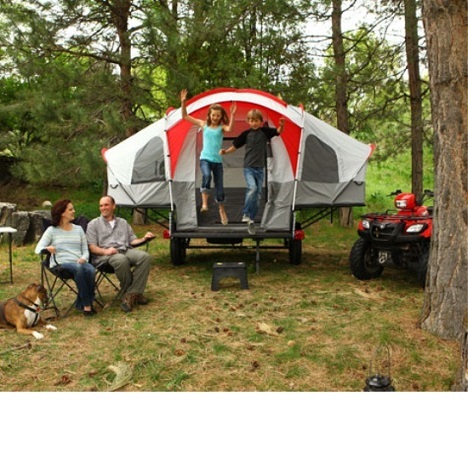 Save space with the 2-in-1 Great Basin Utility/Tent Trailer. It's a heavy-duty utility trailer and recreational tent trailer all rolled into one awesome product. 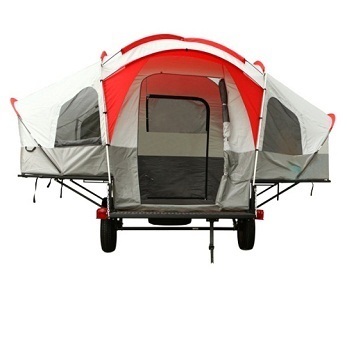 The trailer is constructed from heavy-duty steel mesh and the tent can accommodate up to 6 people. Sets up in just minutes! Lifetime's Great Basin Tent Trailer is a heavy-duty steel utility trailer that comes with a lightweight nylon denier tent that can be set up in just minutes. The 7 x 5 ft trailer bed will accommodate the tent in its own storage bag as well as an ATV, motorcycle, kayak, etc.--whatever equipment your recreational hobbies require! The tent can accommodate up to 6 people and is designed for a 360 degree view and plenty of ventilation with front and rear doorways and 8 large windows. Beds can be extended to queen size with our bed extension/ramp Accessory. Spare Tire Kit Accessory available as well. Ships as a kit with assembly required. Competitive Edge Products is an authorized distributor of the 65048 Lifetime Great Basin Utility Tent Trailer. Trailer dimensions and weight allow for comfortable towing by compact sized SUVs. Trailer has a 2,000 lb. GVWR. 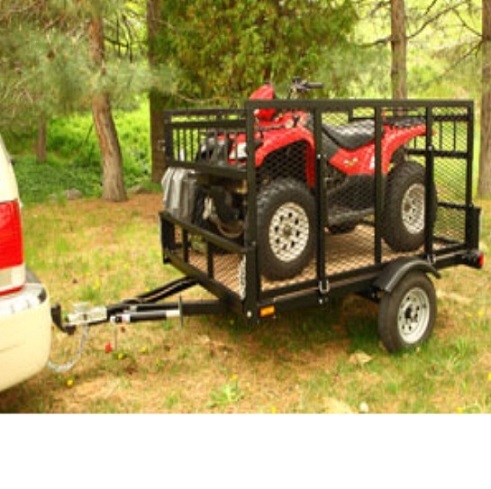 Trailer bed is perfect for an ATV or other gear. Trailer side gates lay down to create trailer wings to be used as twin bed platforms for tent or used as tables or workbenches without the tent. Heavy-duty steel frame has a durable, rust-resistant powder-coated finish. Trailer bed features solid wood flooring. 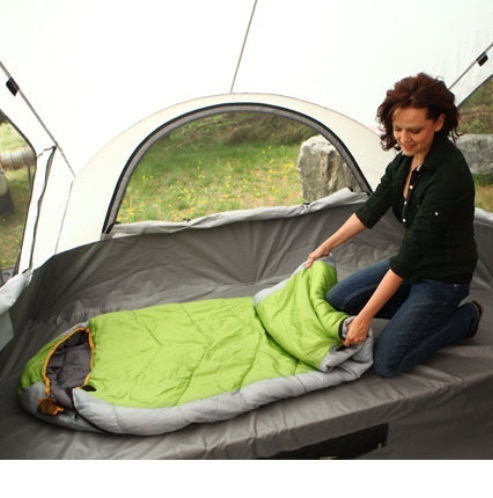 Compact, lightweight Tent Kit weighs only 25 lbs and comes in its own storage bag. Tent has spacious 7 ft 4 in. ceiling and 84 square-foot interior to provide plenty of living space as well as eight large windows, a front and back door, and two screened vents for ultimate ventilation and 360 degree view. Weather-resistant bag protects the tent during transportation and storage. A: This item was discontinued in 2014. I'm sorry for the bad news. Q: What is the difference between the 65048 Great Basin Trailer and the 65047 Sahara Utility Trailer? A: The Sahara (tan/green tent) is a 250 denier material tent so it is a little better quality than the great basin tent (red/gray) which is 200 denier. The Great Basin requires a few more poles to set it up but has a taller ceiling. Q: Does this model include the four wheeler ramps? A: 65048 does not include four wheeler ramps. They are available sold separately as model number 65045. This product ships via an ltl freight carrier for a curbside delivery. This type of delivery requires the customer to be present for the delivery to both sign for the shipment and to move the product wherever needed on the delivery property. The driver will not assist with moving the product, so please plan accordingly with sufficient help to move the trailer wherever needed. For help in preparing for the delivery, below are the approximate shipping weight and shipping dimensions. Shipping weight: about 700 lbs. Shipping dimensions: about 120 inches x 84 inches x 20 inches. Dimensions: 196" x 160" x 30"